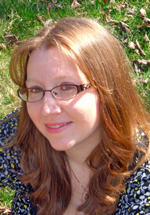 Writer with Sizzle Interview: Tricia Schneider! Please welcome romance author Tricia Schneider! Tricia would like to give away a PDF copy of her latest paranormal romance release, Witch and the Vampire, to one lucky commenter, so be sure to leave your email address in the comments section so she can reach you. Tricia Schneider worked at a bookstore for 12 years, 6 of those years as Assistant Manager. Now she writes full-time while raising her three young children. She lives with her WWII re-enactor husband in the coal country of Pennsylvania. Lia: Welcome, Tricia! Tell us about your latest release. 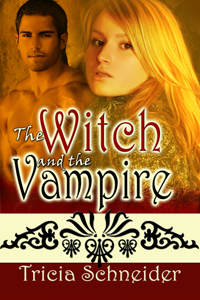 Tricia: My novella, The Witch and the Vampire, is the sequel to my 2010 debut, The Witch and the Wolf. These stories are connected but can be read out of order. Sisters, Lillian and Melora Merriweather are running from an evil uncle. The Witch and the Vampire is Melora’s story. Sebastian Collins should have left for London days ago. Now a snowstorm has trapped him with a woman who has come seeking protection, a woman who intrigues him like no other. And with each passing hour, his hunger for her grows…hunger for her kiss, her caress, and her blood. Lia: Love the sound of this! (And gorgeous cover, by the way.) What is your favorite thing about being a romance writer? Tricia: I can’t remember a time when I wasn’t writing. Even when I was very young, I remember drawing pictures and creating stories about the images I drew. Being an author is just a natural step for me. Being a romance author is like adding icing to the cake. I am addicted to a happily-ever-after. I’m known among my friends and family for re-writing the sad endings to dramas and horror movies so that the main character gets a HEA. For me, leaving the story with that sense of peace and happiness, that sense of all is right in my character’s world, is a comforting experience. Lia: I’m a sap for happy endings, as well. How would you describe the world you’ve built? Tricia: The Merriweather Witches live in Regency England of the early 1800’s. In my world, paranormal creatures such as vampires and werewolves exist but are kept hidden from ordinary humans. Some humans are aware of the existence of these creatures and become vampire-hunters, witch-hunters, etc. The witches in my world have special magical powers that are passed down by their family members. The creatures that inhabit my world are on the darker side of romance. I’m in the process of writing more stories for this series and I’m exploring the possibility of many more paranormal creatures I can introduce to the Merriweather family. Lia: As a writer of the paranormal, what makes you want to write about things that go bump in the night? Tricia: I’ve been a fan of all things paranormal since I was a young child living in my grandmother’s haunted house. Yes, some very strange unexplainable things happened there. It fascinated me and I began reading all I could about ghosts and spirits. My mother also influenced me with her love of the 1960’s soap opera, Dark Shadows. As I became addicted to watching it with her, I became fascinated with vampires, werewolves, witches and all else paranormal. It’s fun for me to create my own world filled with vampires, werewolves and romance. Lia: Very interesting about your grandmother’s house! I’d love to hear more about that. Do you have a favorite writer you’ve read over and over? Tricia: I can’t pick only one! I have so many favorite authors, though there’s only a few I re-read more than once to study and analyze their writing. Lynn Kurland, Gayle Wilson, and Daphne du Maurier are three of those authors. I love their writing style, the way they create scenes and the emotion that they weave with their carefully chosen words. I still cry every time I read This Is All I Ask by Lynn Kurland, and I think I’ve read it 5 times! Lia: Where can readers find your books? Lia: I’m on my way to pick it up! Thanks for being a Writer with Sizzle, Tricia!